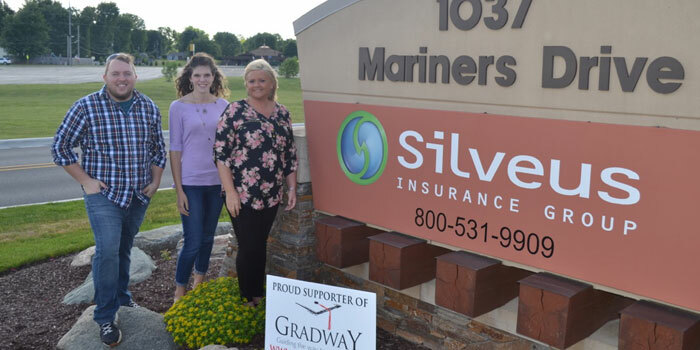 Gradway would like to thank Silveus Insurance Group for showing support of Kosciusko County students by investing in Gradway. This donation was matched by The Dekko Foundation and will help local students who are at risk for not graduating be able to receive coaching to guide them toward successful completion of high school. It is local community members and businesses getting involved and supporting Gradway that help at risk students build a “future story.” Thank you for your support. Gradway’s mission is to promote high school graduation one relationship at a time. Their middle- and high-school programs serve four area school corporations: Tippecanoe Valley, Warsaw, Wawasee and Whitko. Gradway just completed its sixth year of operation and has served more than 1,400 students during that time. Gradway is a 501(c)(3) public charity and is entirely funded by grants and individual or corporate donations.